When my studio redesign was finished, I thought that these little pillows looked so cute with my new tall chairs. Actually, I still think they're cute! I originally placed them on the chairs as back cushions. Then the granddaughters came to visit and sat on the chairs to draw at the cutting table. Oops! The chairs weren't quite tall enough for them, so I suggested that they sit on the pillows. Sitting on a pillow, it turns out, isn't always that great. They were probably fine for the littles, but when I tried it, I never could get comfortable. Frankly, though one would think otherwise, my bottom needed more cushion! 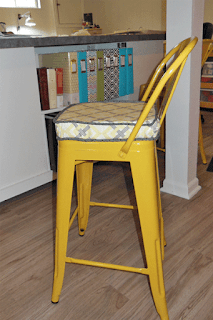 When I found the perfect fabric in the remnant rack at JoAnn, I snapped it up with a couple of foam cushions. 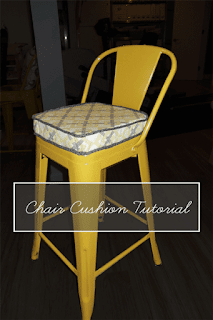 First, I needed a pattern for my seat cushions. 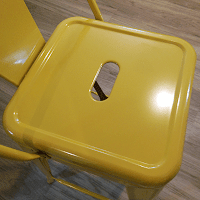 I was happy that my chairseats are kind of embossed, giving me an easy line to trace. 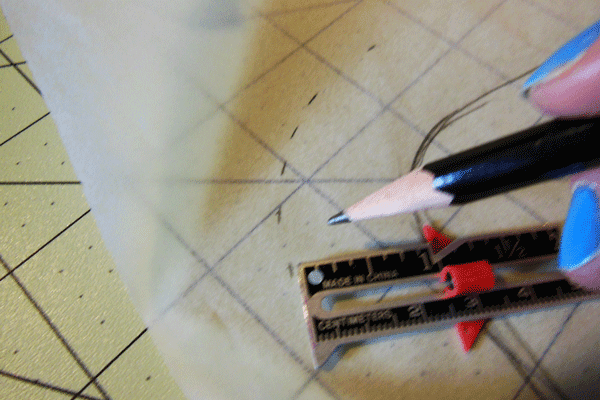 I have a roll of tracing paper that I bought on sale at an office supply store which I use to make patterns. 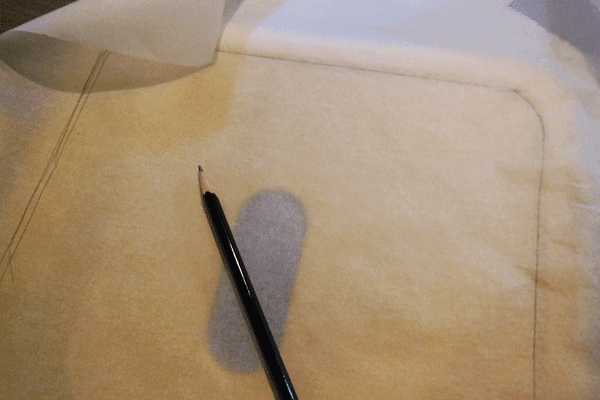 For this project, any paper would work, but tracing paper is my go-to. I tore off a piece and placed it on top of the chair seat, then drew a pencil line around that inset "square." I didn't want my cushions to be only the size of that indented space on the chair seats, so I added an inch all around. I used my sewing ruler and a pencil to make marks one inch away from my drawn line, then connected the marks to make the line for my cushion size. 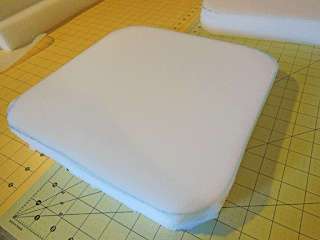 I cut that pattern out and pinned it to my purchased foam cushion. I just pushed the pins down into the foam. I aligned two of the pattern sides with the edges of the foam so I wouldn't have to cut so much. 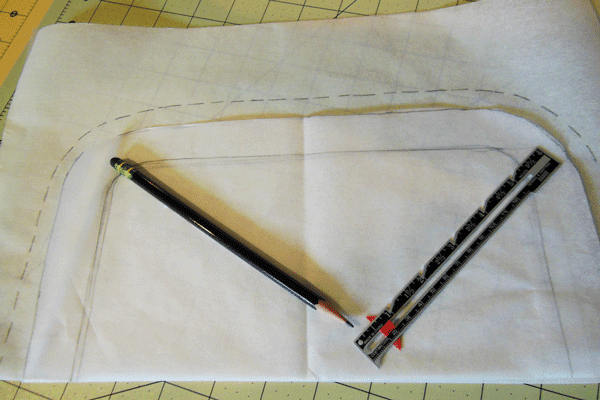 I traced around the pattern with a Sharpie and removed the paper pattern and pins. 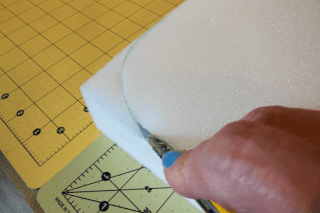 Then I used a craft knife to cut the foam. I like to use those utility knives that you can buy at the hardware store. It's the kind where you can just snap off the end when it gets dull and you have a fresh blade. You can also buy replacement blades to have on hand. I found it worked best to be patient and make several cuts on each line, cutting deeper each time. My cushions are two inches thick, so it didn't take much time. When I was finished, I had two custom foam cushions for my two chairs. Now, if you want a really nice looking cushion, this would be the time to wrap it in batting and put a muslin cover on it. I decided to skip those steps. Now I needed a pattern for the fabric cover. I folded another piece of tracing paper in half. 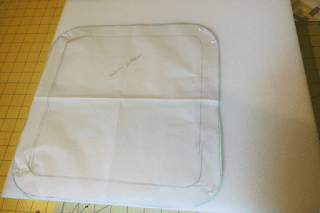 Then I folded my cushion pattern in half and placed it around the tracing paper so than the folded edge of the tracing paper was against the inside of the folded edge of the pattern. Then I used my sewing ruler to make marks on the tracing paper 1/2 inch away from the edge of the cushion pattern. Then I connected the marks and cut on that line, then unfolded my new pattern for the cushion cover. 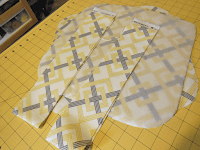 Using that pattern, I cut two pieces for each cushion. 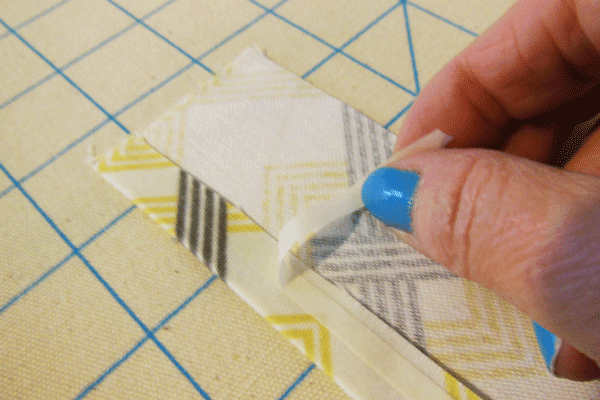 I also cut strips 3" wide and long enough to go around my cushions for the side pieces. 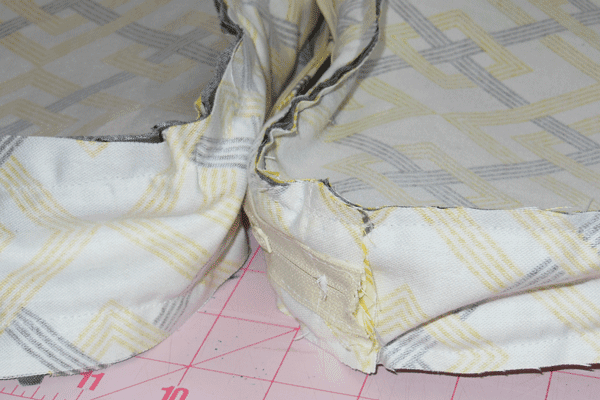 I cut them 3" wide because the cushions are 2" deep and I added two 1/2" seam allowances. 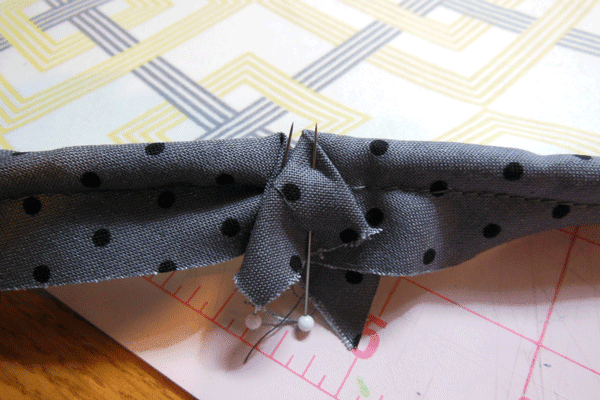 After I cut my fabric for the cushions, I decided to add some piping, so I pulled some gray fabric with black dots from my stash and made my own. 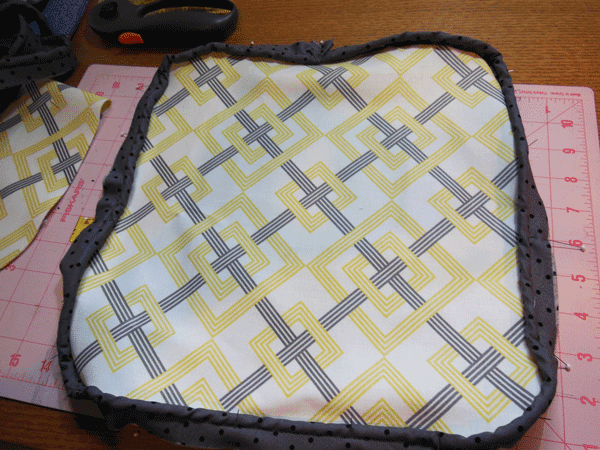 I began to put it all together by sewing piping to each of the seat cover main pieces. I like to do this quick and easy "join" for the ends of the piping. You can find the standard method here or here. 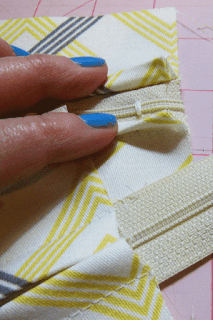 First, I pulled the bias covering back about one inch, while holding the end of the filler cording. I clipped off that inch of cording, then straightened out the bias covering. 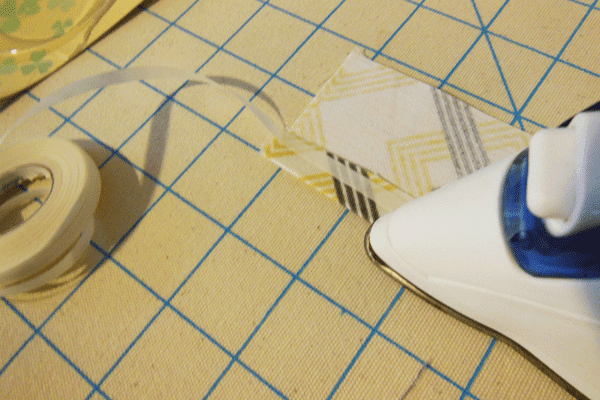 Then I folded that empty part of the piping back at a 45° angle and pinned that fold in place. 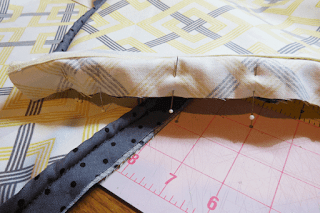 Then I pinned the piping to right side of the seat cushion piece, matching edges, with the fold point at the center back of the cushion. I continued to pin all the way around. 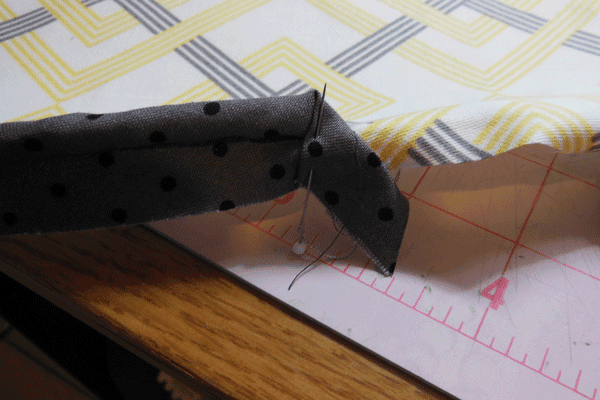 I (should have) clipped the seam allowance of the piping as I worked my way around the curves. 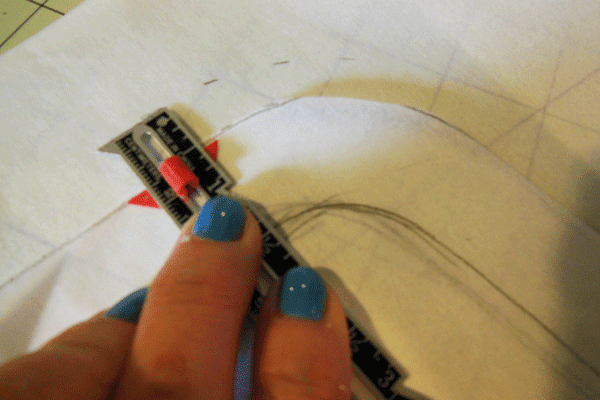 When I got back to the beginning, I cut the piping about one inch past the beginning point. As before, I pulled back the cover fabric and cut it so that it would end at the same point as the beginning point. Then I straightened out the cover fabric, folded it back and pinned it. 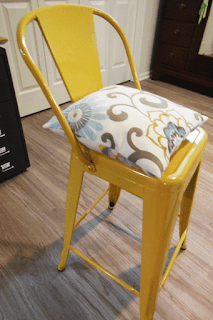 Still using my zipper foot and a longer stitch, I sewed the piping to the seat cushion fabric. I repeated this for my other seat cushion pieces. 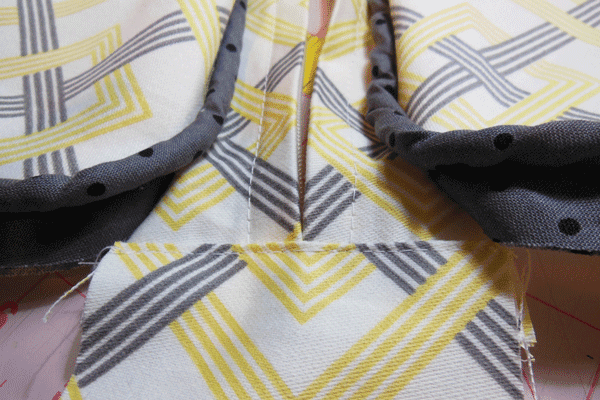 Then I was ready to add the side pieces, and I really dithered about whether to add zippers. I decided that I should, since it was likely that I would want to wash the seat covers. I had hesitated because I didn't have much leftover fabric, and each zipper section would require two pieces at least two inches wide. Once I figured out that I had enough fabric to do that, I went ahead with my plan. 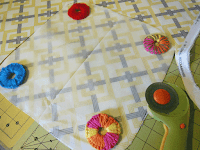 For each cushion cover, I cut two pieces of fabric 2 1/2" wide and as long as the width of the cushion plus 1". I pressed back 1/2" on one long side of each piece. 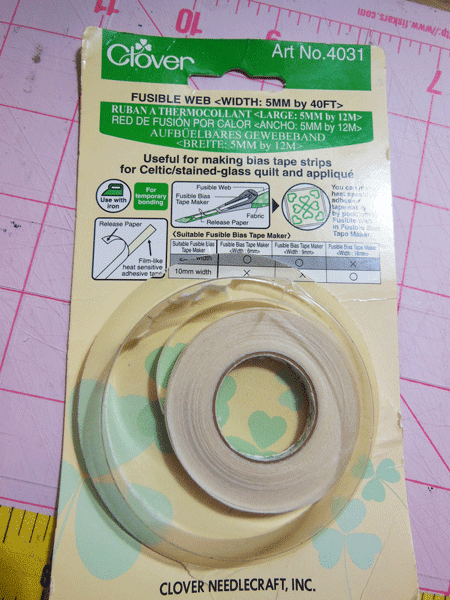 To attach the zipper before stitching, I decided to use this fusible web product. 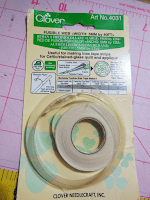 It is fusible web with a paper backing. 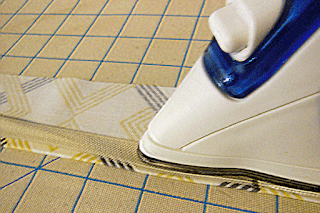 I ironed the fusible web close to the raw edge of the folded over part of the fabric, being careful to have the paper side up. Then I carefully pulled off the paper backing. 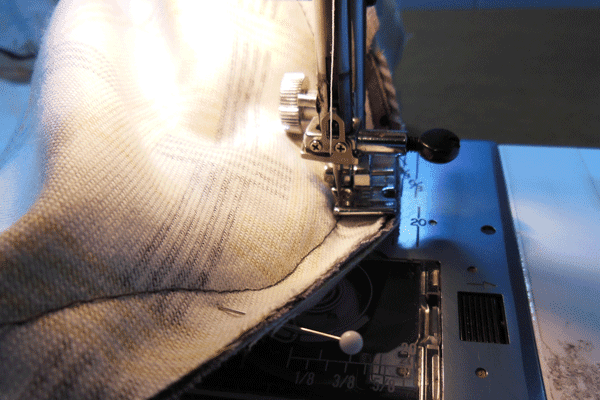 I opened the zipper and placed each side right side down with the zipper teeth at the folded edge and pressed. I did have a little trouble getting the web to fuse. I'm not sure if it was because my web was old or if it just didn't like fusing to the zipper tape. Once I had both sides of the zipper fused, I closed the zipper and sewed it in. 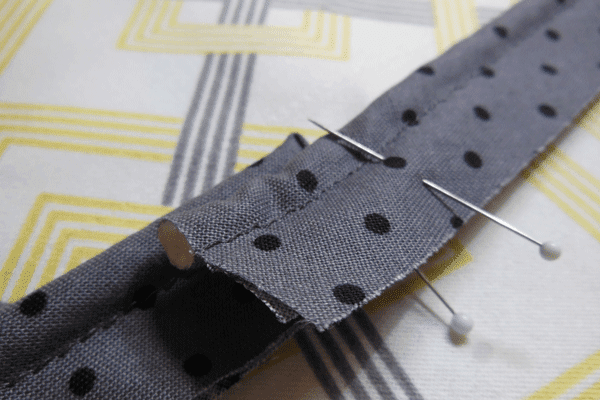 I used zippers that were longer than I needed, so I shortened them by bar tacking about 1/2" from the end of my insert, then cutting the end of the zipper off. 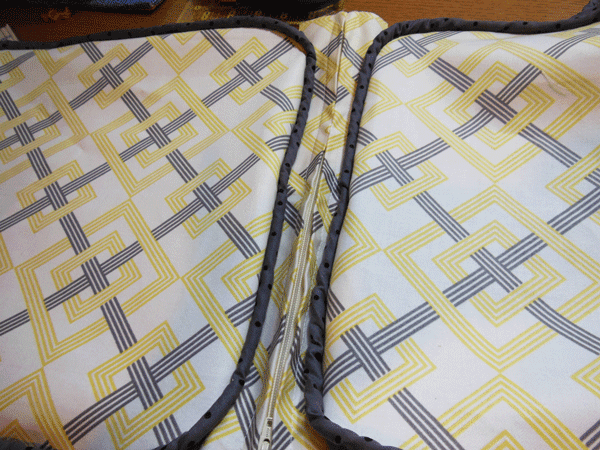 I trimmed my insert to 3", the same width as the strips I cut for the cushion sides. I pinned the zipper insert to the cushion piece, right sides together and matching the center of the insert to the center back of the cushion cover. I sewed these together starting and ending stitching about 1-2" from the end of the zipper insert. I did the same with the other cushion piece. Then I pressed under 1/2" on one short end of a side panel strip. 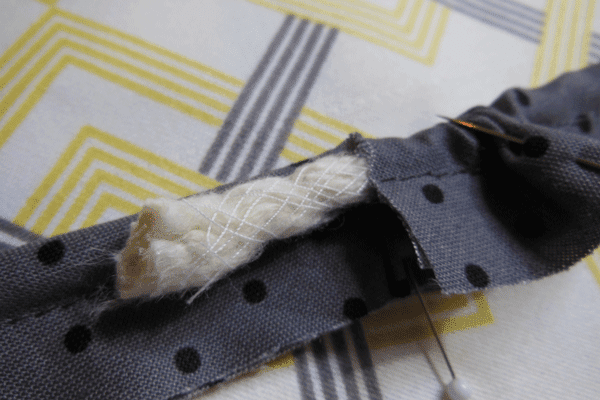 I pinned that to one end of the zipper insert—pressed-under side down, raw edges together—and stitched close to the folded edge. Then I made sure that the zipper was open, and pinned the other side of the side panel to the other cushion piece. 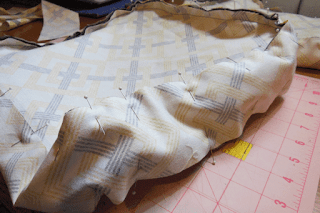 Using the zipper foot, I sewed each side of the panel to the cushion piece, beginning and ending at the stitching for the zipper insert. I trimmed the seams and clipped curves before turning the cover right side out. I did a quick press with a little steam before I inserted the foam cushions. Then I used a little steam after the foam was in. Finally, I put those cute and comfy cushions on my chairs. Now everybody can enjoy relaxed bottoms!